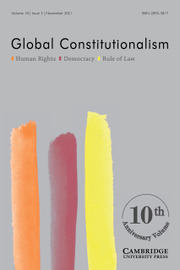 Global Constitutionalism (GlobCon) offers an interdisciplinary space for addressing the foundations, limitations and contestations of the principles and norms of political order and their dynamics over time on a global scale. The journal publishes cutting-edge peer-reviewed work which refers to and advances global constitutionalism as an interdisciplinary field. Submissions are invited from a broad range of disciplines including International Law, Political Science, International Relations, Comparative Constitutional Law, Comparative Politics, Political Theory and Philosophy. In the first issue of each volume, the editors critically engage with progress made and challenges which lie ahead for further advancement of the field. These annual editorials are published on a free-to-read basis. Published in association with the Professorship for Global Public Law and the Center for Global Constitutionalism at the WZB, Berlin.